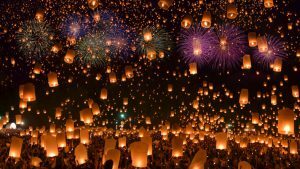 The festival of Loi Krathong is also known as The Festival of Light. It is celebrated in Thailand on the evening of the full moon of the 12th month in the traditional Thai lunar calendar. Therefore, the exact date of the festival changes every year but in the Western calendar it usually falls in November. 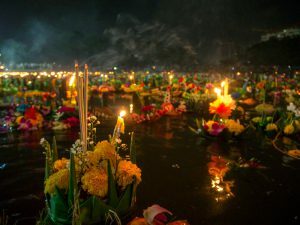 Loi Kratong festival denotes the end of the rice harvest season when Thai people give thanks to the Water Goddess for an abundant harvest – and apologise for polluting the waters during the year. Thais believe it is the time to symbolically ‘float away’ all your anger and bad spirits and make merit to ensure a happy, healthy and wealthy new year. 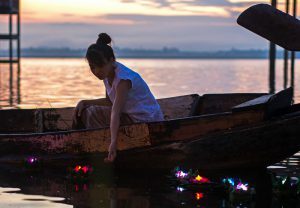 Loi means to float and krathong is a handmade mini raft. 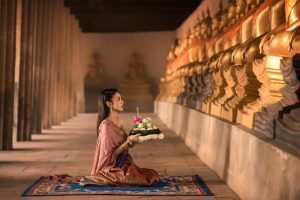 Legend has it that in the 14th century, a Sukothai king’s wife made a lotus flower krathong and offered it to the King. The king, taken with the present, floated it on the water and so started the tradition of Loi Krathong. A krathong is a circular, plate sized float made from a slice of a banana tree trunk decorated with folded banana leaves, flowers, candles and incense sticks. Thai people often add personal effects to the krathong for example a nail clipping, a strand of hair, a piece of cotton from clothing and a low value coin. 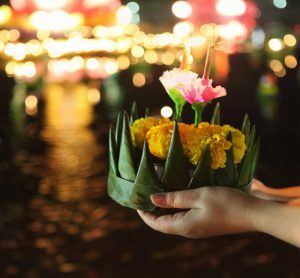 On the full moon night, in November, the krathongs are released onto water to symbolically float away any anger or grudges and pay respect to the water spirits. You can buy krathongs in local shops close to Kalyana or get all your family and friends together to make your own. If you do decide to buy one, make sure you buy natural, biodegradable krathongs. The Kalyana team can organise delivery from a local florist. Please check with the villa team at Kalyana before you start picking flowers and chopping banana trees! • Cover the banana trunk slice with some banana leaves cut to shape. • Hold a strip of banana leaf horizontally, fold the top corners in to make a triangle like making a paper plane. • Fold the corners in again to make a long thin triangle. Cross over the bottom sections of the triangle to form a base. • Cut off the edges at the bottom of the triangle. 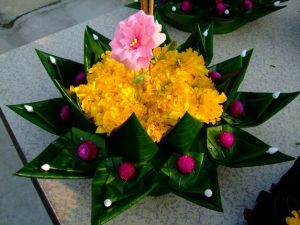 • Put a pin through the base and pin the triangle leaf, so the triangle sits up, to the top of the krathong on the edge. Repeat until the banana base is circled with the leaf triangles. • Tape a couple of pins to the outside of the candle and then secure it to the top of the float. • Add a few incense sticks and then decorate the remaining area with a collection of brightly coloured flowers. • Add a finger nail clipping, a strand of hair and a coin.That’s it. Your personalised krathong is now ready to float. That’s it. Your personalised Krathong is now ready to float. See https://www.youtube.com/watch?v=0rOp73Xlweo for a visual guide on how to make your krathong. Kalyana’s beach front location is the perfect place to participate in Loi Kratong. The shallow, calm sea of Laem Sor ensures your krathong a smooth journey out to sea. As a group, take your individual krathongs and join the Thais at the water’s edge. Hold the krathong up to your forehead and make a wish before you place it on the sea and watch it float away, taking your bad luck and negative thoughts off into the horizon. It’s mesmerising to watch hundreds of little lights peppering the ocean. making merit will give us happiness. 1. The candle is a symbol of knowledge and wisdom. The incense stick is a symbol of purity and sympathy. The flowers represents the monks who are the disciples of Buddha. 2. Strands of hair, nail clippings or even bits of clothes are to get rid of the bad stuff of the past. 3. Coins are added to the krathong to bring wealth and as a way of making merit. 4. 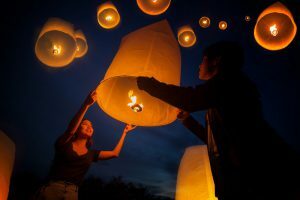 For the romantic at heart or young couples, Loi Krathong is the time to make a wish for happiness together. Two of the most popular places for local Thais to celebrate Loi Krathong are the tourist resorts of Chaweng on the lake and Lamai lagoon. There are large night markets held around the lake and lagoon with stalls selling clothes, accessories, handicrafts and local food. 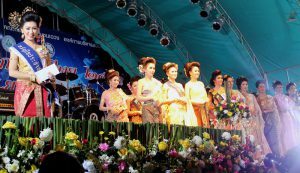 There is often live music, traditional Thai dancing and fairground like activities and a children’s play area.A traditional event is a beauty pageant which the Thais take very seriously. The contestants are extravagantly dressed and made up. 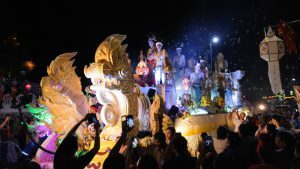 Additionally, Koh Samui government offices and organizations launch large decorated krathongs competing for the best and most beautifully decorated large krathong. 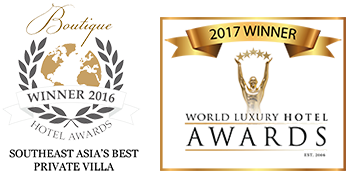 Check out information on Koh Samui to see where these events are being held. For a more spiritual feel, many people head to the big Buddha to float their krathongs off the headland and get a blessing from the monks. This year, 2017, Loi Krathong falls between the 2-4 November depending on the full moon. Check with the Kalyana villa team if you are lucky enough to be staying at Kalyana during this period.